Peak Climbing in Himachal: A Passion Driven, Adventurous Mountain Expedition in Himachal! Himachal, famously known as the "Land of the snow", is one of the most mesmerizing and charming states of India. It has a rich as well as varied landscape, from sterile mountain capes to lush green thick forests, from the verdant green meadows to fertile plains. Himachal Pradesh is a stunning destination for a tourist seeking fun and solitude, or a naturalist who wants to take pleasure in the fresh air and stimulating nature, and an adventure enthusiast who wants to feel and experience the most memorable trekking trip in Himachal. Himachal has unlimited offers of peak climbing for the first time climbers as well as great experienced mountaineers. Its extensive valleys, extravagant landscapes and passes are still isolated, waiting to be experienced and explored by the travelers or tourists. Himachal is truly a blessing. It acts as a paradise for the enthusiastic and passionate trekkers, walkers, mountaineers, climbers, rafters, skiers and hikers. Countless trekking expeditions can be experienced or culminated in the captivating valleys of Manali and Kullu. Himachal Pradesh has numerous peaks that can pose challenges to the mountaineers or trekkers. Some of the most famous Himalayan mountain ranges which overlap with Himachal Pradesh are Pir Panjal Range, Great Himalayan range and the Dhauladhar Range. Pir Panjal Range is the largest of the lesser Himalayan range and consists of many glaciers as well as High altitude passes, the Rohtang Pass is one such high altitude pass situated near Manali. A snow- covered peak located in the Pir Panjal Range of Himachal, Mount Ladakhi provides an enthralling peak climbing route which is simply spellbinding all the adventure enthusiasts in no time. This rocky and snowy peak offers the adventure lovers a serene and fascinating landscape which is ideal for the photography fans as well. The matchless tour to Mount Ladakhi is not at all meant for the beginners and demands a bit of peak climbing experience such as advanced mountaineering equipments. For all the nature lovers and adventure buffs who want to take pleasure of the nature's extravaganza, Mount Ladakhi offers the trekkers to drench in the nature's opulence. The ambiance of Mount Ladakhi boasts luxuriant glaciers, grasslands, and snow clad mountain peaks. The trail passes through Dhundi and Bakarthach and enters the Beas Kund glacier. Further, the trek offers exciting vistas of Dhauladhar and Pir Panjal Ranges. Mount Shitidhar is a majestic peak and a snow clad mountain which is popular among the dedicated mountaineering students. Certainly, Mount Shitidhar serves to be the training ground for some bigger trekking expeditions in the Greater Himalayan peaks. The name Shitidhar comes from- Shiti meaning "Sharp" and Dhar meaning "Edge". Close to Mount Shitidhar lie Manali and Ladakhi trekking peak and there are many other popular peaks around the beautiful hill station, Manali. Situated in Beas Kund in Himachal, Friendship peak- a division of Pir Panjal Range, flaunts an elevation of 5289 meters in the Kullu district of Himachal. Climbing friendship peak is not very technical, and the best part of this trek is the experience of the famous hill station of Manali. Here, the local markets, people and the feel of this tourist attraction is spell casting. The beautiful Solang Valley, Bakarthach base camp, lush green forests and valleys are the major highlights of the magical friendship peak. This majestic peak, covered with the pristine white snow, should be visited and climbed during the months of May- June and September- October. The nearest airport is the Kullu Manali airport and the nearest railway station is the Joginder railway station. Brimming with the richness of the majestic peak, seven sisters is an extremely blissful experience for a tourist. The brilliant ambiance along with the white pristine snow covered mountain imparts serenity and creates a long lasting impression in the minds of the adventure lovers or peak climbers. 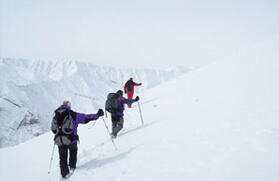 The exotic charm of the peak seven sisters of Manali renders high spirit and excitement to the climber or the trekker. 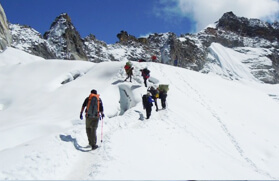 Further, to climb this peak, a climber has to trek Dhundi first, which is a walk of six kilometers. Only after trekking Dhundi, the trekkers can climb the snowy and imposing Seven Sisters peak. The unique tour can become more heartwarming if the tourists are given the opportunity to explore the Solang Valley and trek to Dhundi as well. The Seven Sisters peak climbing trip will definitely want you to come back over and over again. This majestic mountain peak, covered with rocks and snow, is perched at a height of 6001m. Mount Deo Tibba is a challenging peak, which can be climbed after climbing various lower level peaks. 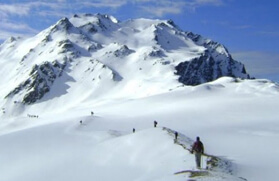 The trek to Mount Deo Tibba is very famous as it offers amazing views of Deo Tibba, near Manali. An eminent peak on the watershed separating the Brara Shigri and Tos glaciers in Lahaul, Papsura is known to be the peak of the evil. To the southeast of Papsura, Dharmsura peak is situated, which is known as the peak of Good. Sometimes, Papsura is confused with Dharmsura. But Papsura was first climbed by a British service team in 1976 and Dharmsura was first climbed in 1941 by a British expedition team. Papsura is an extremely exquisite region, providing a mesmerizing panorama of the boasting and imposing mountains. Being the 2nd highest peak in the Himachal Pradesh province, a British service team first climbed it in 1970. Menthosa is a great trekking experience for those travelers or trekkers who are looking to climb a challenging, imposing and a more technical peak, which shall require some special mountaineering skills as well as fixing ropes. Kullu is the nearest airport from Mount Menthosa. The best season to climb this extraordinary peak is from May to September. A technical and superb peak (lying near Manali) for climbing the Western Himalayas with an elevation of 19220 ft. With a steep ascent, Mount Hanuman Tibba is similar to a pyramid comprising of different looks on each of its sides. The unique and charming tour is wonderful for the adventure enthusiasts who are having the passion to get drenched into the nature's pulchritude. The trekking and mountaineering expertise of our professional trekkers will surely make your trekking experience a memorable one!